The program provides strategies and tools that help students with visual impairments learn about the world, perform everyday activities, and participate in the general curriculum and other activities in school. This certificate offers the required coursework for Virginia PK-12 teacher licensure in Teaching Students with Visual Impairments. Coursework is offered primarily online with a face-to-face weekend for hands-on training in orientation and mobility. Visual Impairments Consortium: The Virginia Consortium prepares teachers to be highly skilled at working with students with visual impairment and blindness. The consortium is supported by a grant from the Virginia Department of Education. Every semester, a limited number of tuition stipends are awarded to qualified applicants. The Visual Impairments coursework offers background knowledge in teaching students with visual impairments. 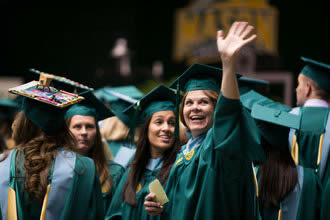 Completing undergraduate credits partially fulfills requirements for teacher licensure in Virginia. Students can complete a minor in Visual Impairments, start their graduate program as a student in the Accelerated Master’s program, or just take a few classes to begin to explore Visual Impairments as a career option. There is currently a nationwide shortage of trained professionals qualified to work with students with visual impairments. The Mason program prepares teachers to be highly skilled at working with students with visual impairment and blindness. Completion of the program meets Virginia Department of Education’s required competencies for teachers of students with vision impairments.